TaskClone allows you to quickly create events from OneNote tasks. Add events as tasks beginning with "sch: " (case-insensitive). Write the events in natural language (e.g. Meeting at 1000 State St. on Tue 2/16 at 1pm). Use "sch+: " to send to task app and calendar. Do not add events in a OneNote table. Add hashtag + trigger tag to initiate process (e.g. #taskclone). Add anywhere on the page except in a table. We initially configure "taskclone" as your trigger tag. Add "#" and your trigger tag to alert TaskClone you want to process the tasks in this page. You can always login and change your trigger tag from the Dashboard. Sync/Save Changes. OneNote should sync automatically. 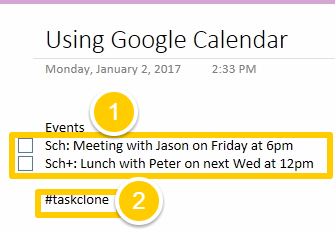 When OneNote syncs > TaskClone is notified of the events, extracts them and immediately sends them Google Calendar. 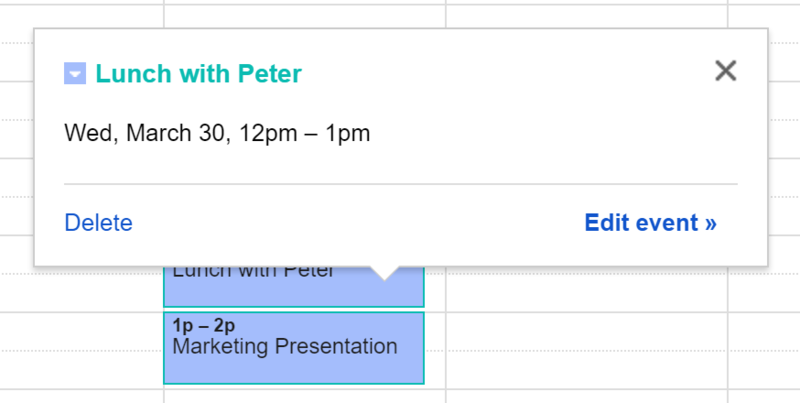 Google Calendar converts the natural language into an event. Typically, the event shows in 0-5 minutes. When TaskClone is finished > it removes the trigger tag and adds Skip Codes to event to prevent the item from being cloned again. You must sync again or wait for OneNote's auto-sync to see the changes TaskClone has made to your note. Important! Do not edit the note again until OneNote syncs again and you see the trigger tag is removed and Skip Codes added next to each event. TaskClone will only process the same note once every 2 minutes.